Police throughout the United States are making preparations to crack down on possible protests following an imminent decision on whether to bring charges against Darren Wilson, the Ferguson, Missouri police officer who shot unarmed teenager Michael Brown on August 9. A grand jury is expected to return a decision on indictment as early as today. The Associated Press carried a story Saturday reporting that police are “ready” for protests in cities throughout the country. The report followed the announcement last week by Missouri Governor Jay Nixon that he would call in the National Guard in the event of protests if there is no indictment of Wilson. The implications of the article are quite plain. In a country where the “right of the people peaceably to assemble, and to petition the Government for a redress of grievances” is included in the Bill of Rights, police respond to the very possibility of protests with thinly veiled threats of mass arrests, tear gas and rubber bullets. A decision not to indict Wilson, by a grand jury that has been manipulated by the prosecutor’s office, would be extremely provocative, flying in the face of forensics evidence and multiple eyewitness accounts indicating that Brown was gunned down even though he posed no threat to Wilson. This is particularly true since an indictment is not a guilty verdict, but simply a finding that there are sufficient grounds to have a public trial. In the event that charges are brought against Wilson, the one-sided and selective leaks of information from the grand jury, likely coordinated by state officials and presented uncritically in the media, will have already poisoned public opinion, including potential jurors in any trial. Earlier this weekend, the St. Louis Post-Dispatch released key evidence relating to the shooting, including radio dispatch recordings on the day Michael Brown was killed, and video surveillance footage showing Wilson arriving at a hospital two hours after the shooting. Attorneys for the family of Michael Brown noted that the video evidence contradicted earlier claims by police officials that Wilson was severely injured prior to the shooting. At the time, major media outlets, including the Post-Dispatch itself, passed off these unsubstantiated claims by the police as good coin. Also on Saturday, Ferguson police chief Tom Jackson made clear that Wilson will not be fired if charges are not brought against him, and that he will instead be allowed to return to work. The preparations by police throughout the US indicate that the ruling class is well aware of the explosive social tensions that are building up in the United States. The November midterm elections earlier this month exposed the chasm between the political establishment and the working class. Extremely low voter turnout revealed that broad sections of the population are alienated from and increasingly hostile to the political system as a whole. In the aftermath of the elections, the Obama administration announced that it would double the US troop presence in Iraq, despite mass opposition to war by the population. Social inequality is soaring, while the state asserts ever-more sweeping powers to spy on the population and police proceed as though they have a license to kill workers and young people with impunity. The fact that there can be no expression within the political system of social opposition means that this opposition will take other forms. 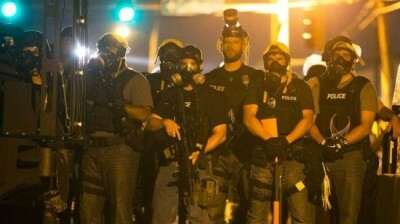 The protests in Ferguson in August already expressed the hostility that exists among workers and young people to social inequality and the pervasive attacks on democratic rights, including the growth of a massive and unaccountable military/intelligence apparatus in the United States. The political establishment, both Democrats and Republicans, has responded to the protests with a two-pronged strategy. Behind the scenes, the Obama administration facilitated and coordinated a police crackdown that employed military equipment transferred to local departments as part of programs that have been vastly expanded over the past decade. On the other hand, the White House has worked with the proponents of racial politics to present the Brown killing as an issue of “race relations” in an attempt to channel popular opposition back behind the Democratic Party. The Democrats have connections with a network of local organizations that aim to obscure the fundamental social and political issues at stake in the killing of Brown and the police response to the protests over the summer. The fundamental question presented by the events in Ferguson is not one of racial or “community” relations, but of the immense social chasm between the corporate and financial aristocracy on the one hand, and the working class and youth on the other. The state violence that has been used and is being prepared is the response of the ruling class to the class tensions building up in America.